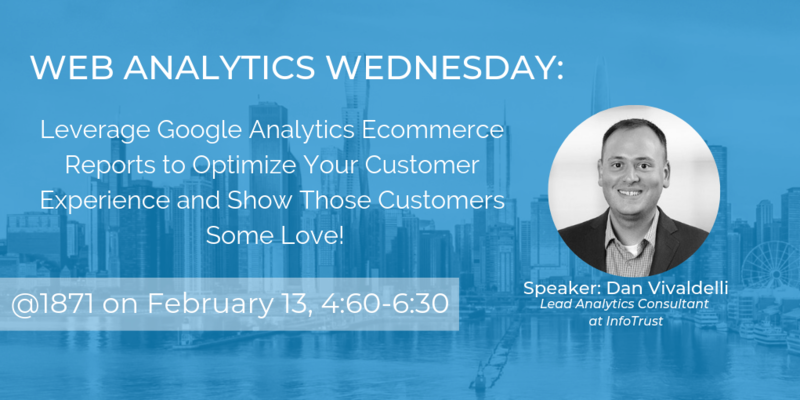 Join InfoTrust the day before Valentines Day to share in the love of enhanced e-commerce reporting in Google Analytics. Join InfoTrust the day before Valentines Day to share in the love of enhanced e-commerce reporting in Google Analytics. Unfamiliar with what that is? Well, have no fear—they will show you some of Google’s most advanced e-commerce and product reporting along with how to use these reports to optimize your customer experience and marketing campaigns. The event will be followed by a round of open topic Q&A on Google Analytics and, of course, a happy hour! Web Analytics Wednesday is a community and series of events with the goal of bringing analytics professionals together to network and share challenges and solutions within the digital analytics industry. The hope is to create awareness of strategies, trends and tools in analytics, as well as to bring the analytics community together for discussion. WAW is a networking and knowledge-sharing event; it is not intended for sales pitches or solicitation. InfoTrust is a digital analytics consulting and technology company that helps businesses analyze and improve their marketing efforts. They work with some of the largest, multi-site enterprises in the world with a focus on those in the eCommerce, CPG and the News and Media industries. InfoTrust is a Google Certified Partner in Analytics, Optimze 360, Data Studio, Google Tag Manager and Google AdWords. Dan Vivaldelli is a Lead Analytics Consultant at InfoTrust with a decade worth of experience in helping CPG brands gain insight into their customers' behavior through analytics. Given his background in e-commerce merchandizing and marketing, Dan spends most of his time helping e-commerce clients optimize their websites and marketing activities. Dan has a BS in Informatics from Indiana University and also holds an MS in Business Analytics from the University of Notre Dame.